Donald acknowledges a birdie on the way to his Madrid Masters triumph. 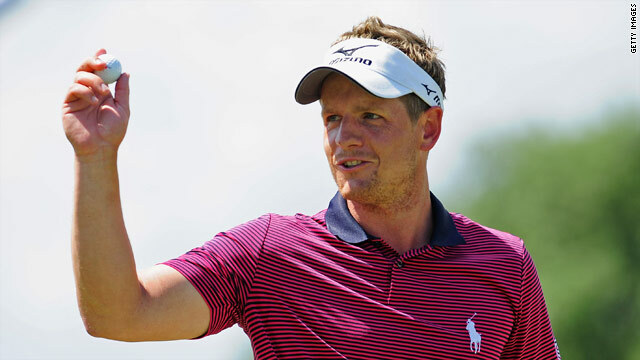 (CNN) -- Luke Donald put his PGA Championship woes behind him to claim the Madrid Masters in thrilling fashion by one-shot from longtime challenger Rhys Davies. Welsh rookie Davies, looked set to deny Donald a title for the second straight title until a superb eagle by the Ryder Cup star on the long 16th. Donald, who blew his chances last Sunday with a double bogey on the 17th to lose by a shot to Simon Khan, hit a fairway wood to 12 feet and holed for his third eagle of the week. Davies birdied to hole to stay a shot behind, but could not hole a 20-footer on the last to force a playoff. It left Donald with a closing 67 to Davies' 68 and with a 21 under par total of 267 and he will rise to ninth in the new official world rankings. But it was the victory which really mattered to 32-year-old Donald who had not taken a title since the Honda Classic on the PGA Tour in 2006, with is in Europe back in 2004. "It's been a while since I won and to put last week behind me makes me very proud," he told the official European Tour Web site. "The way I played today means a lot to me. The eagle was huge because Rhys put a lot of pressure on me. "It's happiness and relief - definitely some relief." Davies, who won in Morocco in what is turning into a superb first season, was proud of his efforts. "I didn't make a bogey in the final group in a big tournament," Davies said. "It didn't quite come off, but I've got lots to be pleased about." Italian Francesco Molinari had also eagled the 16th in the pair ahead and finished third on 18-under with Northern Ireland's Graeme McDowell in fourth after a superb 65.